Employers should be wary of the difference between USC exempt status (as per P2C/tax credit certificate) and employees in receipt of USC exempt income. If an employee expects their income to be less than €13,000 in the tax year they can contact Revenue to make a declaration of same, it is only the employee themselves that can make this declaration. Revenue will update the employees USC status to USC exempt and issue a new P2C/tax credit to the employer. The employer will follow this instruction and USC will not be deducted from the employee accordingly. If an employee is in receipt of USC exempt income, e.g. Community Employment Participants, Department of Social Protection payments, these employees will not necessarily hold USC exempt status on the P2C/tax credit certificate. The exempt income itself should be flagged as USC exempt within the payroll. Community Employment Participants are allocated PRSI class A8 or A9. 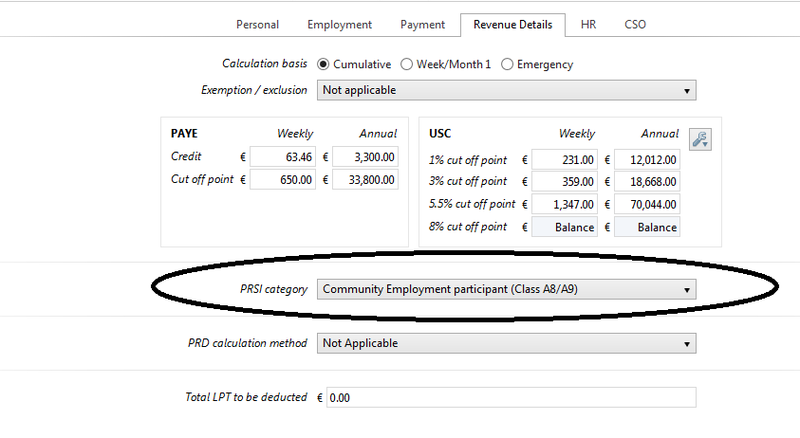 Once the PRSI category of Community Employment, A8 or A9 is assigned to the employees record in 'Revenue Details' all income for the employee will be classified as USC exempt (regardless of any USC rates or bands which may be updated from the P2C).